UNITED NATIONS (Sputnik) - The UN Security Council looks set to vote Friday on a Kuwaiti-drafted resolution seeking protections for Palestinians in Gaza after the Thursday session was delayed. The 15-nation body has a meeting scheduled for 3 p.m. EST Friday (19:00GMT) that will deal with the "situation in the Middle East, including the Palestinian question." The draft lambasting "excessive use of force" by Israel against Gazan protesters and escalation of violence on the border with Israel was largely expected on Thursday. It was delayed after US Ambassador Nikki Haley warned she would "unquestionably veto" the Arab-backed resolution she called one-sided and morally bankrupt as it exclusively blamed Israel for the violence. Haley said the resolution never mentioned the Gaza-based Hamas militant group, which Israel accuses of stoking tensions in the exclave during weeks of deadly protests by Palestinians. The UN human rights commissioner previously demanded that Israeli soldiers exercise restraint in using live fire against Gazans, who seek to return to their ancestral lands. 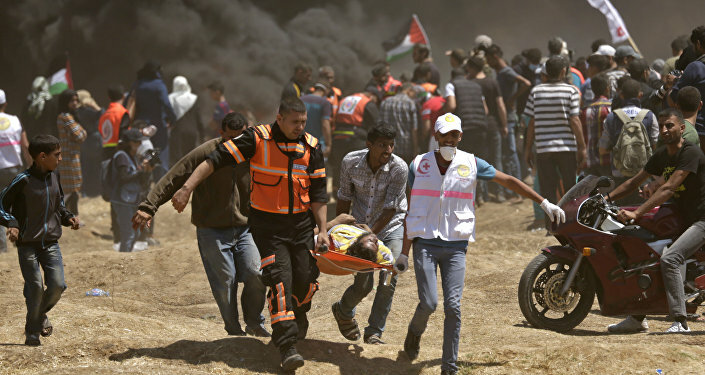 Over a hundred have died and thousands have been wounded since the "Great March of Return" began two months ago.